On February 15, 2003, the United Kingdom saw its largest-ever protests in reaction to Prime Minister Tony Blair’s plans for war against Iraqi dictator Saddam Hussein. In 2014, acclaimed documentarian Amir Amirani crafted a powerful account of the lead-up to the war, the protests, and their after-effects. 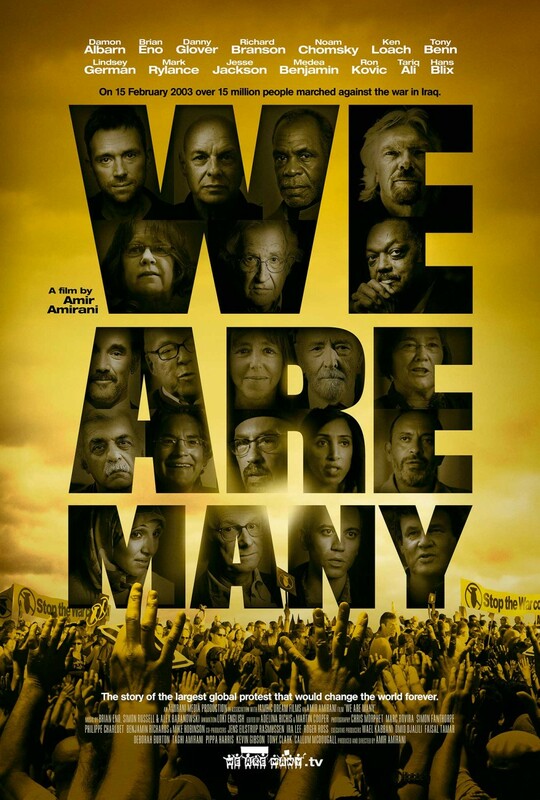 The documentary, We Are Many, proceeds in blistering, blockbuster (“blockumentary”?) fashion, with talking heads but no voiceover, and with much passion and anger and sentiment but little in the way of dry analysis. When the imparting of hard facts is absolutely unavoidable, the job is done with dramatic white text on a black background. When white isn’t dramatic enough, the text is occasionally red. 24-like, a calendar counts down the days – and, later on, the hours – left until the country goes to war. The first time it happens, we see the calendar flip chillingly from September 10, 2001 to September 11, 2001. But that’s not the opening scene; it’s only the opening scene of the film proper, because it begins with a prologue and a stylised opening credits sequence set to music, like a James Bond film. The style and the pace of the film are appropriate because, despite the horrors of 9/11, despite the hundreds of thousands or possibly millions of Iraqi deaths, the primary tone here is elation. The protests are the main focus, and they’re the point the film is strongest on, and while it’s immensely powerful to see overhead shots that illustrate the sheer popular power of the protests, with Hyde Park host to throngs of people like a music festival, there is little attempt to get complex about the reasoning behind the war, or the military strategy, or even the science – or lack thereof – behind the weapons reports suggesting Saddam had WMDs. That last one is a slight shame, since one of the film’s star talking heads is UN weapons inspector Dr. Hans Blix. Blix is very, very good, as is one of the other true insiders the production team managed to snag: Col. Lawrence Wilkerson, chief of staff to Colin Powell and a critic of the war, including his own rôle in presenting documents that distorted Iraq’s military capabilities. When Wilkerson announces towards the end of the film that he would be prepared to face imprisonment himself if that’s what it took to see Bush and his cabinet tried, it’s a moving moment in a film whose moving moments are too many to enumerate. But for the most part, it isn’t the corridors of power that interest Amirani; it’s the man or woman on the street, and the energy of the film is the popular energy that led millions to attend protests in London, and Madrid, and Rome, and New York, and Canada, and across South America, Africa, the Middle East, and even Antarctica, where not just penguins but actual people, researchers, protested in the cold and lost their jobs for it. In Sydney, two mild-mannered scientists climbed the Opera House to paint “NO WAR” in one of the film’s pleasanter, funnier sections: much like in this year’s other documentary on left-wing activism, Johanna Hamilton’s 1971, the men responsible seem bemused looking back on their own daring. 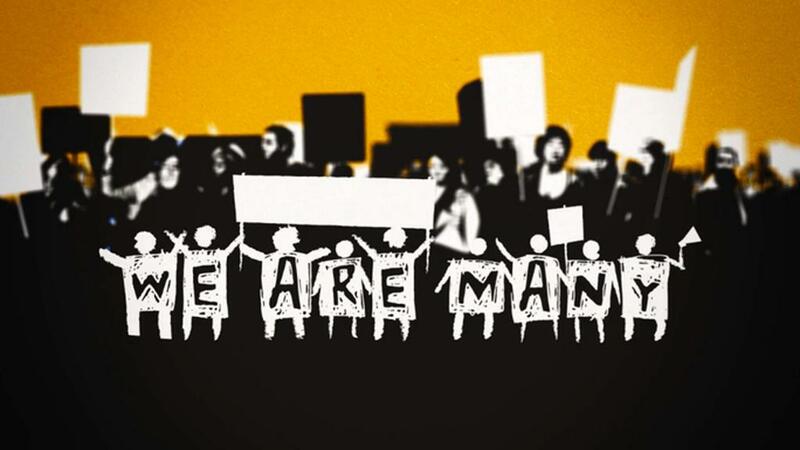 Also like 1971, We Are Many is bound to receive criticism for its blatant favouring of the activists rather than “The Man”; but, since this isn’t the BBC and neither film ever really claims to be an even-handed look at its subject matter, to attempt a more balanced view would only unfocus the picture further, and both documentaries suffer slightly whenever they attempt to widen their scope. A subplot of We Are Many deals with the effect of the protests in Egypt, and draws a direct line from those events to the Arab Spring, but it isn’t discussed in much detail. Similarly, the film’s happy ending – that the United States and United Kingdom didn’t go to war in Syria in 2013 because of the lessons learned in Iraq – feels a little tacked on. On the other hand, what would the film’s message be otherwise? Despair, since the mass mobilisation of protesters did nothing to prevent the war? Such a message would seem counterproductive, whether it’s a fair assessment or not. There is already enough despair in the film’s second half. While intellectually, I was aware the protests were a failure – I can recall fairly clearly the country’s mood of frustration with the war at the time, even if, as a precocious 12-year-old, I was probably just repeating the views of my mother and The Guardian – but it’s so easy to forget that fact in the excitement. When the MPs’ vote came around, with “7 HOURS TO WAR”, it hit me like a twist in a well-made thriller. And the film deals exceptionally well with the horrific moral consequences of the war. Bush cracks jokes at a Representatives’ dinner about his failure to find WMDs, while his humorous slideshow is intercut with footage of civilian injuries and civilian deaths. The lack of any sort of remorse on the part of Bush or, most especially, Blair, is enough to re-anger any viewer at the lack of any effective tribunal. Blair gives his pyramid hands at the Chilcot Inquiry and one is strongly inclined to agree with those assessments that conclude he’s a sociopath. After his PMship is over he becomes a peace ambassador to the Middle East, and you’re so burned out with anger you can only laugh with cynicism. Blair’s cabinet is represented in the film by a critical Clare Short, an ambivalent Lord Falconer (who defends the war but also admits that no future government would likely ignore mass protest on that scale again), and an uncritical David Blunkett, whom one wishes had been given a bit more of a grilling. Another key talking head is The Telegraph’s Peter Oborne, of whom I really would have liked to see more. He’s the film’s only conservative voice, and his intelligence as well as his remorse over not having done more in support of anti-war causes goes over extremely well. The rest of the talking heads are more conventional, though almost all are intelligent and likeable: key left-wing intellectuals such as Ken Loach, Noam Chomsky, and the late, beloved Tony Benn; the organisers of the major anti-war groups in each country; and a smattering of politically active entertainers such as Brian Eno, Damon Albarn and Danny Glover. I don’t think there was any point at which I felt my attention wandering, even when the film’s focus did, and the editing and the choice of music was judicious and right. This will sound trite, but Amirani has a gift for eliciting an emotional reaction just so, and it strikes me that that’s half of what filmmaking is. So what do you think about We Are Many? Does it stoke your interest? Let us know what you think below and be sure to visit Christian’s site Mediocre Batman! I really want to see this. It happened just before I arrived in the UK so I didn’t get to join the protests. I don’t generally believe there is much point to protesting since the man will do whatever the man is going to do but I think there was something special about this one even if it failed. For me, it was a little before my time. But the doc is so searing (if you’ll pardon the cliché) that it’ll involve you anyway. & about that last point – I’m not sure it’s so straightforward. The film might just change your mind, perhaps.